Im Herzen der Cevennen, von der UNESCO für seine Landschaften und Natur klassifiziert, werden Sie die echte natürliche Freuden variiert Vegetation, ein traditionelles Dorf mit Häusern aus Schiefer gebaut, und auch die Freuden der Tafel mit pélardons (Ziegenkäse finden ), Pilze (Steinpilze, Pfifferlinge ...), Kastanien, Wild). Situated on the hillside overlooking the pine covered hills .. amazing views over the area from the lounge... a10 Minute walk and your at the village with restaurants and tabac, grocerie sore etc.. also the river where locals swim and our children enjoyed time with fishing nets.. lots of wildlife spotted including kingfishers and heron... a couple of deer spots while driving too..
A great base for exploring the area .. amazing sites to explore in the National Park including Gorge do Ardèche and Gorge du Tarn ...to name but a few.. We have visited France many times and to date we would say this has been the most amazing scenery and stay .. The owners are very friendly but not intrusive .. lots of information provided..maps and travel guides that are free too use .. Andre also gave us an overview of the area which was very helpful. Hope to visit again as one week was just not enough! A beautiful part of the world and wonderful hosts too! We had a fantastic week here, relaxing by a lovely pool and enjoying both the heat and the views. It really is a beautiful part of the Cevennes. It was a little tricky to find (our sat nav took us to the wrong side of the river) despite Yves having supplied us with a detailed map in advance. Once we knew where the house was it did of course made perfect sense. However, Yves drove to rescue us and we followed him back - I forgot to ask if that had happened before but suspect it may have? Our apartment was the perfect size for the 4 of us, with an outside area in the sun for breakfast and a cooler area at the back in the shade for lunch. The views were amazing and aircon much appreciated! Although there isn't a big supermarket close by, the village had everything we needed; mini market, boulangerie, butchers, wine shop and even a Sunday market. The Cevennes restaurant on the main street served good simple French food (you need to book) and there were a couple of bars too. Yves and Laurence were perfect hosts, we rarely saw them but when we did it was easy and relaxed and they were always available to answer questions/offer advice when we needed it. They didn't even mind the children's shrieks of joy whilst playing in the pool which is always a bonus. Whilst there, another family of 4 were staying in a house below ours. The kids had a great time together and the pool was plenty big enough for us all. We very much hope to return for a longer trip next year so that we have a bit more time to explore the local rivers and take a train to Nimes - that's if we can drag ourselves away from that pool! Thank you for your apreciation. Séjour parfait , le logement est impeccable et l accueil chaleureux et tout en discrétion . A conseiller vraiment pour ceux qui désirent visiter cette très belle région des Cévennes . Merci pour votre appréciation qui nous motive pour continuer le plus humainement possible. Excellent accueil de la part des propriétaires .La location était très agréable et conforme aux indications.Pouvoir nager seule dans la tres belle piscine au milieu des Cevennes a été un véritable luxe.Nous recommandons vivement cette location idéale pour se ressourcer et profiter de tous les attraits de la région. 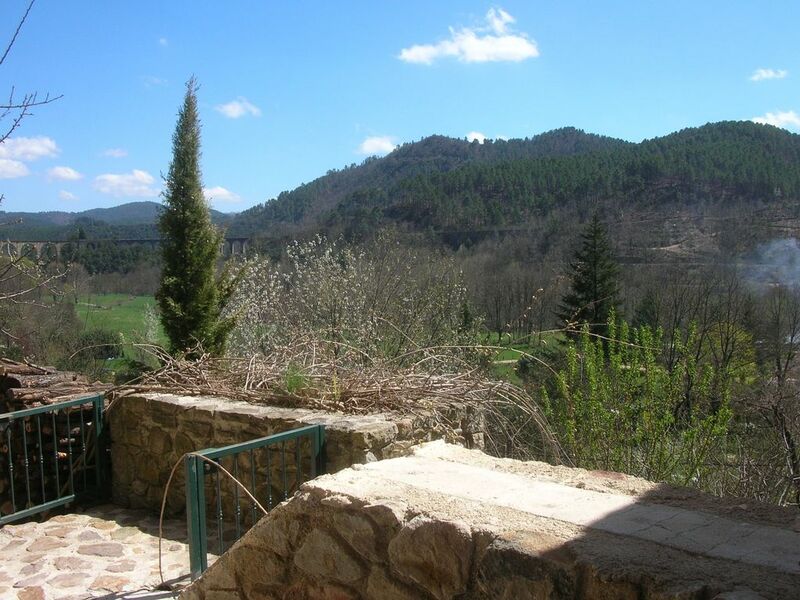 Perfectly sited appartment with stunning views to the wooded hillsides across the Leuch valley. Well equipped and very comfortable. The pool is of large size, private and offers further open views. The appartment is tranquil yet just a few minutes walk from Chamborigaud village for bakery, shops, restaurants and the market. There is plenty to do or simply relax. The cycling is awesome with quiet smooth roads, mountain views and impressive scenery. We went to a local lake for water sports and swimming, did Via Ferrata, wild gorge swimming, several short hikes and visited the Pont du Gard. M Andre was very hospitable and attentive to our needs from booking, to providing information on the area and even assisting us when our travel to France from the UK went awry due to an airline problem. Definitely recommended for tranquillity, scenery, culture and outdoor activities. A perfect base for a stay in the Cevennes! Thank you to have appreciated the rent and the nature of the Cévennes. This appreciation is a big comfort. In the pleasure to receive your friends also. Détaché pendant 2 mois sur un chantier proche, j'ai pu pleinement profiter de ce lieu pour y trouver un calme permanent ainsi qu'une vue exceptionnelle dont on ne se lasse jamais. Ce logement tout confort ma permis de trouver le repos que je recherchais tout en alliant le côté pratique professionnel (Wi-Fi de très bonne qualité ). De plus, toutes les commodités se trouvent à proximité. En résumé, je conseille vivement cet endroit qui doit prendre encore une autre ampleur lors d'un séjour de vacances. merci beaucoup pour cette appréciation qui résume bien notre volonté de qualité de nos locations et notre ouverture toute l'année aussi. Au plaisir de voir accueillir à nouveau.